Capacity: 15 producers, writers and performers. The Roundhouse is collaborating with Industry In The Streets (IITS) to launch a pilot series of producer-led masterclasses called Groundbreakers. Inspired by the musical mavericks that have helped to shape the UK soundscape, the session aims to encourage participants to collaborate and innovate. The first part of the session will be hosted by Fusion (The Groundbreaker, Big N Bashy, The Greatest Show). 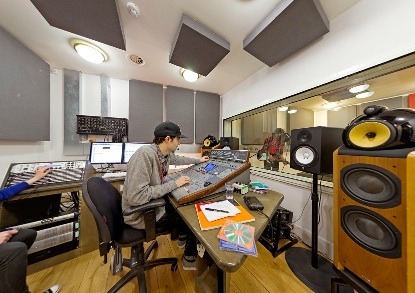 Established producers Spider J, Pepstar, Scratcha DVA and new skool maverick Joss Ryan will share their journey, talking about their passion for music and offering advice and tips to the new generation of music makers taking part in the session. The second part of the session will focus on the creation of new music. Fusion and guests will open up the Roundhouse studio, MIDI suites, and live room in an effort to challenge the participants to share skills and push boundaries. At the end of the day we will come together to hear who has risen to the challenge. The results will become part of an ongoing process to create a body of truly groundbreaking music.